1932–1964, as well as silver issues dated 1992 to 2018: .900 silver, .100 copper. Circulation strikes since 1965: .750 copper, .250 nickel, clad to pure copper core. Bicentennial silver clad coins: .800 silver, .200 copper bonded to a core of .210 silver, .790 copper (overall, .400 silver). Silver issues beginning in 2019: .999 silver, .001 other. D, S, P, W (no mint marks used 1965 to 1967; "P" mint mark omitted on Philadelphia Mint issues before 1980). Found under the intersection of the branches on the reverse until 1964, later issues on lower part of obverse to the right of Washington's neck. On December 2, 1924, Congress created the United States George Washington Bicentennial Commission. The 200th anniversary of the birth of Washington, the first President of the United States, would occur in 1932, and Congress wished to plan for the event well in advance. President Calvin Coolidge was ex officio chairman of the commission, which included government officials as well as prominent private citizens such as automobile manufacturer Henry Ford. In 1929, the Secretary of Commerce, Herbert Hoover, succeeded Coolidge both as president and in his commission role. By that time, however, the commission had become inactive, doing little after sending out an initial flurry of press releases. A new group, the George Washington Bicentennial Committee was established by Act of Congress in February 1930. Hoover was concerned about the large numbers of designs used for commemorative coins in the 1920s; he feared that confusion would aid counterfeiters. When a commemorative coin bill was sent to him by Congress, Hoover vetoed it on April 21, 1930. In a lengthy veto message delivered to Congress with the returned bill, Hoover noted his counterfeiting concerns, and stated that the coins were selling badly anyway—large quantities of Oregon Trail Memorial half dollars remained unsold. The Bicentennial Committee wanted a commemorative Washington half dollar, and sought to assuage Hoover's concerns by proposing that all 1932 half dollars depict Washington instead of bearing the usual Walking Liberty design. The Depression had decreased demand for coin in commerce; no half dollars had been struck in 1930, and none would be until 1933. Most commemorative coins at the time were struck in a quantity of a few thousand. The half dollar was seen as the largest and most prominent design—the Peace dollar was not then being struck and did not circulate in much of the country. Other commemoratives had been sold at a premium, the Washington half dollar would, for one year, be the normal Mint issue. Although it had not yet received congressional approval, the committee went ahead and began a competition. The committee anticipated that the same artist would first design the committee's medal and then the coin. The obverse of both medal and coin were to be based on the well-known sculpture of Washington (1786) by French sculptor Jean-Antoine Houdon; the artist was not restricted as to the reverse design. By law, coinage designs were approved by the Secretary of the Treasury, at that time Andrew W. Mellon, a noted art collector and connoisseur; it was anticipated he would interpose no objection to the plan. Laura Gardin Fraser's design for the quarter was used on a 1999 commemorative half eagle. After reviewing the entries, both the Bicentennial Committee and Fine Arts Commission agreed on designs by Laura Gardin Fraser. The wife of James Earle Fraser, designer of the Buffalo nickel, Laura Fraser was a notable coin designer in her own right, having designed several commemorative coins, including the Oregon Trail Memorial pieces. With a right-facing Washington, Fraser's designs were to be used for the medal, and, as those involved expected, the half dollar as well. On February 9, 1931, New Jersey Representative Randolph Perkins introduced legislation for a Washington quarter, to the dismay of the Bicentennial Committee and Fine Arts Commission. The House of Representatives Committee on Coinage, Weights and Measures issued a memorandum stating that the design of the existing Standing Liberty quarter had been found to be unsatisfactory, and that the new piece would not only be struck for 1932, it would permanently replace the older design. 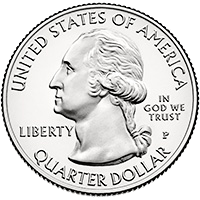 Thus, a new quarter would both be a tribute to Washington on his bicentennial, and relieve the Mint of the burden of having to coin a difficult-to-strike piece. On February 12, Fine Arts Commission Chairman Charles W. Moore wrote to the House Committee, objecting to the change of denomination, and proposing that they mandate that Laura Fraser's design for the medal also appear on the coin. Moore was ignored, and Congress passed authorizing legislation for a Washington quarter on March 4, 1931. The act provided that Washington's image, to appear on the obverse, was to be based on the "celebrated bust" of the former president by Jean-Antoine Houdon; Fraser had based her design on Houdon's work. The Standing Liberty quarter had long presented production difficulties; in 1931, Congress required it to be replaced. On July 14, 1931, Assistant Mint Director Mary Margaret O'Reilly wrote to Moore, asking the Commission's advice on a design competition for the new quarter. Moore replied, stating that as Fraser had won the competition for the medal, she should adapt her design for the quarter. Secretary Mellon responded to Moore, stating that as the Treasury had been no party to the earlier design agreement, it was not bound by it, and would not follow it. The Treasury proceeded to hold a design competition, and when the Fine Arts Commission met to consider the submitted designs in an advisory role, it selected those submitted by Fraser. The designs were submitted to Mellon in November 1931; he selected Flanagan's design and notified Moore of the decision. Moore and commission member Adolph Weinman (who had designed the Mercury dime and Walking Liberty half dollar) attempted to get Mellon to change his mind, but only got him to agree to allow the various sculptors more time to improve their entries—they had asked for more time just for Fraser. On January 20, 1932, following resubmissions, the commission affirmed its support of the Fraser designs. Mellon left office on February 12, 1932; he was succeeded by Ogden L. Mills. With a new Secretary of the Treasury in office, Moore renewed his protest, sending Mills a letter on March 31 deprecating Flanagan's design and urging the new secretary to accede to the commission's recommendation. Mills had already been briefed by O'Reilly on the quarter matter, and responded to Moore on April 11. Secretary Mills informed Moore that the chairman's letter had caused him to request changes from the sculptor, but that he would not override Mellon's decision. On April 16, the selection of Flanagan's designs was publicly announced. Mellon was aware of which artists had submitted which designs, and has been accused of discriminating against Fraser as a woman. Numismatic historian Walter Breen stated, "it has been learned that Mellon knew all along who had submitted the winning models, and his male chauvinism partly or wholly motivated his unwillingness to let a woman win." Bowers, however, noted that Mellon had approved Fraser's designs for commemorative coins several times, as well as those by other women, and that no contemporary source speaks to any bias on Mellon's part. Bowers called the belief "modern numismatic fiction". Fraser's design was used in 1999 as a commemorative half eagle issued 200 years after Washington's death. Plaster copy of bust of Washington by Houdon (1786); Houdon's work was adapted for Flanagan's profile image. As originally struck, the quarter depicts a head of Washington facing left, with "Liberty" above the head, the date below, and "In God We Trust" in the left field. On the reverse, an eagle with wings outspread perches on a bundle of arrows framed below by two olive branches. In 1785, the French sculptor Jean-Antoine Houdon was commissioned by the Virginia General Assembly to sculpt a bust of Washington, who had led the nascent United States to victory in the American Revolutionary War. Houdon had been recommended by the recently returned United States Minister to France, Benjamin Franklin. The retired general sat for Houdon at Mount Vernon, the Washington family home in Fairfax County, Virginia between October 6 and 12, 1785. The sculptor took a life mask of the general's face—Washington's adopted granddaughter Nelly Custis, aged six at the time, later recalled her shock in seeing Washington lying on a table, as she thought dead, covered by a sheet and by the plaster for the mask. She was told that two quills extended into his nostrils, providing him with air. A bust at Mount Vernon today testifies to that visit. On his return to Paris, Houdon used his visage of General Washington in a number of sculptural settings, including the commissioned statue for the General Assembly, which still stands in marble in the Virginia State Capitol. Portraits of Washington on medals and in other media subsequent to the sculptor's visit were most often based on Houdon's work, beginning with the 1786 "Washington Before Boston" medal engraved by Pierre Simon DuViviers. Although only one American, Abraham Lincoln, had appeared on a circulating US coin by the 1920s, the Houdon bust had been used as the basis of the portrait of Washington on the commemorative Lafayette dollar dated 1900 and on the Sesquicentennial half dollar of 1926. According to coin dealer and numismatic historian Q. David Bowers, the Houdon bust, even then, was the most common representation of Washington on coins and medals. Little is known of Flanagan's creative process, although models of Flanagan's quarter with a different portrayal of Washington, facing right, and with a different eagle, have come on the market. Flanagan's adaptation differs from the Houdon bust in some particulars: for example, the shape of the head is different, and there is a roll of hair on the quarter not found on the bust. Art historian Cornelius Vermeule said of Flanagan's quarter, "a die designer could do little wrong in having Houdon's Neoclassic image as his prototype ... Still, it might be asked whether or not it was fair to force an ideal[ized] portrait of Washington made in 1785 on an artist working in 1932. There is something cold and lifeless about the results." Vermeule suggests that the quarter started a trend of similar portrait coins issued by the United States, notably the Jefferson nickel and Franklin half dollar. The historian preferred Laura Fraser's version, and termed Flanagan's reverse "a stiff bit of heraldry amid too large a wreath and too much or too large lettering". In early July 1932, newspapers announced that the Washington quarter was being struck and would be issued at the end of the month, once there were sufficient pieces for a nationwide distribution. They stressed that the new quarter was not a commemorative. The five Washington quarter obverses: as a silver version, a clad version, the Bicentennial version, the version struck from 1999 to 2009, and the present version struck since 2010. The quarter was released into circulation on August 1, 1932. There was no great need for the coins in commerce; despite that, it was announced that six million pieces would be struck in honor of the Washington bicentennial. The coins were generally well received, though the reverse prompted discussion as to whether a bald eagle was depicted, or some other sort of eagle. An eagle expert consulted by The New York Times concluded it was a bald eagle. About 6.2 million quarters were struck in 1932, of which 5.4 million were coined at the Philadelphia mint. Production runs of just over 400,000 each occurred at the Denver and San Francisco mints; these are still the low mintages of the series. The small mintage of the 1932 Denver piece meant that few were available to be hoarded by coin dealers, leading to present-day scarcity in mint state or uncirculated condition; the mint marks on the 1932-D and 1932-S have been counterfeited. No quarters were struck at any mint in 1933, as there was an oversupply caused by the 1932 issue. Unlike many earlier coins, the Washington quarter struck exceptionally well, bringing out its full details. This sharpness is possible because the designs of both sides were spread out, with no points of high relief. Nevertheless, the Mint repeatedly adjusted the design. In the first three years of striking (1932, 1934 and 1935), three different varieties of the obverse are known. They are generally called after the appearance of "IN GOD WE TRUST", to the left of Washington's head: the Light Motto, Medium Motto, and Heavy Motto. Only the first was used in 1932. All three were used on the 1934 Philadelphia strikes, though only the latter two on the 1934 Denver Mint coins. In 1935 only the Medium Motto was used at all three mints. However, the Heavy Motto apparently proved most satisfactory to the Mint as beginning in 1936 only pieces of that variety were struck at all sites. For unknown reasons, the original reverse hub was used only in 1932; a new hub was used when coining resumed in 1934. The original style had a high rim around the reverse design, protecting it from wear so well that 1932 quarters in lower grade generally are about equally worn on either side. In later years, with a lowered rim, circulated silver pieces tend to be more worn on the reverse. The fine-tuning of the design continued through the end of silver production with pieces dated 1964. During that time, the obverse was modified six times. One revision, in 1944, left Flanagan's initials, on the cutoff of the bust, distorted; this was adjusted the following year. Beginning in 1937, and continuing until the end of silver circulation production with pieces dated 1964, a very slightly different reverse was used for proof coins, as opposed to circulation pieces. This is most evident in examining the letters "es" in "States" which almost touch on circulation strikes, and display a separation on proofs. The piece was struck in numbers exceeding 100 million in some years through 1964. The San Francisco Mint ceased striking coins after 1955; it struck no quarters that year or in 1949. In 1964, there was a severe shortage of coins. Silver prices were rising, and the public responded by hoarding not only the wildly popular new coin, the Kennedy half dollar, but the other denominations, including the non-silver cent and nickel. Hopeful that issuing more 1964-dated coins would counter the speculation in them, the Treasury obtained Congressional authorization to continue striking 1964-dated coins into 1965. The Mint's production of coins rapidly depleted the Treasury's stock of silver. Prices for the metal were rising to such an extent that, by early June 1965, a dollar in silver coin contained 93.3 cents' worth of it at market prices. On June 3, 1965, President Lyndon Johnson announced plans to eliminate silver from the dime and quarter in favor of a clad composition, with layers of copper-nickel on each side of a layer of pure copper. The half dollar was changed from 90% silver to 40%. Congress passed the Coinage Act of 1965 in July, under which the Mint transitioned from striking 1964-dated silver quarters to striking 1965-dated clad quarters. Beginning on August 1, 1966, the Mint began to strike 1966-dated pieces, and thereafter it resumed the normal practice of striking the current year's date on each piece. The new clad quarters were struck without mint mark in 1965–1967, regardless of the mint of origin. Beginning in 1968, mint marks were used again, except that Philadelphia continued to issue coins without them. The San Francisco Mint had reopened, but from 1968, it struck quarters only for collectors, for the most part proof coins. The Mint adjusted both sides of the coin for the initiation of clad coinage, lowering the relief (the modified reverse design exists on some 1964-dated silver quarters). The obverse was slightly changed in 1974, with some details sharpened. Mint marks on post-1967 pieces are found on the lower right of the obverse, to the right of Washington's neck. 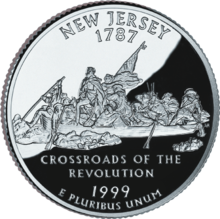 Jack L. Ahr's drummer design was struck for the United States Bicentennial. In January 1973, Representative Richard C. White introduced legislation for commemorative dollars and half dollars for the 1976 United States Bicentennial. On June 6, Mint Director Mary Brooks testified before a congressional committee, and responding to concerns that only the two least-popular denominations would be changed, agreed to support the temporary redesign of the quarter as well. On October 18, 1973, President Richard Nixon signed legislation mandating a temporary redesign of the three denominations for all coins issued after July 4, 1975, and struck before January 1, 1977. These pieces would bear the double date 1776–1976. In addition to circulation pieces, Congress mandated that 45 million Bicentennial coins be struck in 40% silver. Fearful of creating low-mintage pieces which might be hoarded as the cent recently had been, thus creating a shortage of quarters, in December 1974 the Mint obtained congressional approval to continue striking 1974-dated quarters, half dollars and dollars until Bicentennial coinage began. Accordingly, there are no 1975-dated quarters. Almost two billion Bicentennial quarters were struck, as the Mint sought to assure that there would be plenty of souvenirs of the anniversary. The Mint sold the silver sets, in both uncirculated and proof, for more than a decade before ending sales at the end of 1986. 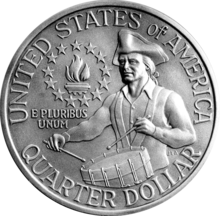 Jack L. Ahr's colonial drummer, which had appeared on the Bicentennial quarter, was replaced after 1976 by Flanagan's original reverse. Beginning in 1976, and continuing over the following twenty years, Mint engravers modified the design a number of times. Quarters were struck at the West Point Mint between 1977 and 1979, but they bore no mint mark. The Philadelphia Mint's mint mark "P" was used on coins struck at that facility beginning in 1980. Coins dated 1982 and 1983, both from Philadelphia and Denver, command a large premium over face value when found in near-pristine condition. Beginning in 1992, the Mint began selling silver proof sets, including a quarter struck in .900 silver; this has continued to the present day. Although President George H.W. Bush signed authorizing legislation for these pieces in 1990, coinage did not begin until 1992 due to difficulty in obtaining sufficient coinage blanks in .900 silver. The Mint traces the origins of the 50 State Quarters program to a congressional hearing in June 1995, at which Mint Director Philip N. Diehl, as well as prominent numismatists, urged Congress to pass legislation allowing a series of circulating commemorative coins similar to the quarters Canada had recently struck for its provinces. In response, Congress passed the United States Commemorative Coins Act of 1996, which was signed by President Bill Clinton on October 20, 1996. The act directed the Mint to study whether a series of commemorative quarters would be successful. The Mint duly studied the matter, and reported favorably. Although the act had given Treasury Secretary Robert Rubin the authority to carry out the report by selecting new coin designs, Secretary Rubin preferred to await congressional action. The resulting 50 States Commemorative Coin Program Act was signed by President Clinton on December 1, 1997. Under the act, each of the fifty states would be honored with a new quarter, to be issued five a year beginning in 1999, with the sequence of issuance determined by the order the states had entered the Union. The act allowed the Secretary to determine the position of the required legends, such as "IN GOD WE TRUST" on the coin: To accommodate a large design on the reverse, "UNITED STATES OF AMERICA" and "QUARTER DOLLAR" were moved to the obverse, and the bust of Washington shrunken slightly. A state's design would be selected by the Treasury Secretary on the recommendation of the state's governor. As part of the series, the Mint sold collector's versions in proof, including pieces struck in .900 silver. The Mint also sold a large number of numismatic items, including rolls and bags of coins, collector's maps, and other items designed to encourage coin collecting among the general public. The Mint estimated that the government profited by $3 billion through seignorage on coins saved by the public and through other revenues, over what it would otherwise have earned. Legislation to extend the program to the District of Columbia and the territories had been four times passed by the House of Representatives, but the Senate had failed to consider it each time. Provisions authorizing such a program were inserted into an urgent appropriations bill, and passed in December 2007. The resultant 2009 District of Columbia and U.S. Territories Quarters Program maintained the Washington obverse but on the reverse displayed designs in honor of the District of Columbia, Puerto Rico, Guam, American Samoa, Virgin Islands, and the Northern Mariana Islands, all minted in 2009. This quarter, honoring New York's Saratoga National Historic Park, was being struck in late 2015. In 2008, Congress passed the America's Beautiful National Parks Quarter Dollar Coin Act. This legislation called for 56 coins, one for each state or other jurisdiction, to be issued five per year beginning in 2010 and concluding in 2021. Each coin features a National Park Service site, one to a jurisdiction. Flanagan's head of Washington was restored to bring out detail. In addition to the circulating pieces and collector's versions, bullion pieces with 5 troy ounces (155 g) of silver are being struck with the quarter's design. In May 2012, the Mint announced plans to strike the first circulation-quality quarters at the San Francisco Mint since 1954, to be sold only at a premium in bags and rolls. All five 2012 designs were struck, the first circulation-quality coins struck at San Francisco since 1983 (when Lincoln cents were struck without mint mark), and the first with the S mint mark since the Anthony dollar in 1981 (struck for mint sets only). In 2019, the silver version of the quarter was struck in .999 silver, marking a permanent change from the previous .900. In 2019, the Mint struck 2,000,000 of each circulating quarter design at the West Point Mint bearing its mint mark W. These were released into circulation mixed in with new coins from Philadelphia or Denver. ^ a b Bowers 2006, p. 30. ^ Bowers 2006, p. 31. ^ Bowers 2006, pp. 31–32. ^ a b Bowers 2006, p. 32. ^ Taxay 1983, p. 360. ^ Bowers 2006, p. 33. ^ a b c Vermeule 1971, p. 178. ^ Taxay 1983, pp. 360–362. ^ a b Bowers 2006, p. 35. ^ Taxay 1983, p. 363. ^ a b c Bowers 2006, p. 36. ^ Breen 1988, p. 365. ^ Guth & Garrett 2005, p. 79. ^ Cadou 2006, p. 120. ^ Vermeule 1971, pp. 177–178. ^ a b Bowers 2006, p. 39. ^ Vermeule 1971, p. 179. ^ Vermeule 1971, p. 180. ^ San Jose News & 1932-07-09. ^ The Reading Eagle & 1932-07-10. ^ a b c Bowers 2006, p. 40. ^ The Star and Sentinel & 1932-08-06. ^ The New York Times & 1932-08-21. ^ Breen 1988, p. 366. ^ Bowers 2006, pp. 46–48. ^ Breen 1988, p. 367. ^ Yeoman 2014, pp. 171–173. ^ Bowers 2006, p. 41. ^ The New York Times & 1965-07-15. ^ a b Bowers 2006, pp. 42–45. ^ Bowers 2006, pp. 49–50. ^ Yeoman 2014, p. 173. ^ Yeoman 2014, p. 228. ^ Bowers 2006, pp. 50–51. ^ a b Gilkes & 2019-04-02. ^ Yeoman 2014, pp. 178. ^ Yeoman 2014, pp. 349–351. ^ United States Mint 2009, p. 4. ^ United States Mint 2009, p. 6. ^ United States Mint 2009, p. 14. ^ United States Mint 2009, p. 11. ^ United States Mint 2009, p. 12. ^ United States Mint 2009, p. 13. ^ United States Mint, DC & Territories. ^ United States Mint & 2010-03-24. ^ Numismatic News & 2009-09-09. ^ Coin News & 2019-02-20. Bowers, Q. David (2006). A Guide Book of Washington and State Quarters. Atlanta, Ga.: Whitman Publishing. ISBN 978-0-7948-2059-6. Cadou, Carol Borchert (2006). The George Washington Collection: Fine and Decorative Arts at Mount Vernon. Mount Vernon Ladies' Association of the Union. Manchester, Vt.: Hudson Hills Press. ISBN 978-1-55595-268-6. Ganz, David L. (1976). 14 Bits: The Story of America's Bicentennial Coinage. Washington, D.C.: Three Continents Press. ISBN 978-0-914478-63-8. Ganz, David L. (December 20, 2007). "Quarter Program Adds Territories". NumisMaster.com. Iola, Wisconsin: F+W Publications. Retrieved February 13, 2012. Gilkes, Paul (March 12, 2012). "Mint touts cost savings in .999 silver switch". Coin World. pp. 1, 52, 56. Gilkes, Paul (May 21, 2012). "San Francisco Mint strikes circulation-quality quarters". Coin World. Retrieved May 21, 2012. Gilkes, Paul (April 2, 2019). "Circulating rarities head to circulation: Quarters with the W mint mark". Coin World. Retrieved April 3, 2019. "Quarter series starts in 2010". Numismatic News. Iola, Wisc. : F+W Publications. September 10, 2009. Retrieved February 13, 2012. "George Washington on new silver quarter". The Reading Eagle. Reading, Pa. July 10, 1932. p. 12. Retrieved February 13, 2012. "Don't Quote Me". San Jose News. July 9, 1932. p. 7. Retrieved February 13, 2012. "New Washington Quarters Are In Circulation Here". The Star and Sentinel. Gettysburg, Pa. August 6, 1932. p. 1. Retrieved February 13, 2012. "The 2009 District of Columbia and U.S. Territories Quarters Program". United States Mint. Retrieved February 13, 2012. "United States Mint Unveils First Five Coins in America the Beautiful™ Quarters Program" (Press release). United States Mint. March 24, 2010. Retrieved February 13, 2012. Unser, Mike (May 21, 2012). "U.S. Mint Ends Production of 90% Silver Coins". Coin News. Retrieved February 20, 2019. This page was last edited on 7 April 2019, at 01:11 (UTC).